A powerful new drama with incredible heart and humor. Tino is a Newark schoolboy sent to live with an abusive aunt after his mother dies protecting him in a street fight. Seeking solace, Tino befriends the cantankerous lunch lady at school who has been diagnosed with MS. The moving, heartwarming climax shows these two unlikely friends helping each other navigate a harsh world. "...Wardell Julius Clark's Redtwist Theatre production paints a pretty clear road map of its own plotting early on, but that doesn't make the journey any less gratifying or the climactic destinations any less emotionally punchy. Notably absent from Hutchinson's frank an sobering story: cynicism." "...The snapshot-montage structure of the play ( currently making its Rolling World premiere under the auspices of the National New Play Network ) renders it particularly well-suited to tiny performance spaces like that of Redtwist. Under the direction of Wardell Julius Clark, an intensely focused cast led by Renee Lockett and Donovan Session resist the temptation to coast on sitcom-cutesy caricature, instead delving their dialogue for grace notes lending warmth and intimacy to personalities too often ignored by adults of superficial values like us." "...It�s a singular experience to sit through what is essentially a feel-good play, and to reach the end with the sense that you�ve actually seen a genuine drama. Such is the rare form and substance of Chisa Hutchinson�s �Surely Goodness and Mercy,� offered by a splendid cast in the ideal intimacy of Redtwist Theatre." "... One of my favorite �storefront� theaters is Redtwist, a PURE storefront on Bryn Mawr Avenue in the Edgewater neighborhood. This intimate space allows the audience to become the perverbial �fly on the wall� almost feeling as if they can reach out and touch the actors. In fact, we could. Today, while witnessing a �rolling World Premiere� of �Surely Goodness and Mercy�, by Chisa Hutchinson, there were times I had to uncross my legs so that the actors could get off the �stage� ( if you have ever been to Redtwist, you know there is no actual stage). They keep you on your toes for sure." "...This is an imperfect production. Director Wardell Julius Clark guides this cast into some beautiful and grounded performances, yet also made a few choices that struck me as odd, purely from a logistical standpoint: the transitions are slow, the physical world-building is often unclear and generally affects the pacing, tension and clarity of the piece. But if you want heart, look no further. There is no denying its utter loveliness. It deserves an audience." "...The live actors maintain such a cohesive illusion it's easy to forget that we are watching two adults play people much younger than themselves. (Although this reviewer would have bought fourteen more easily than twelve). 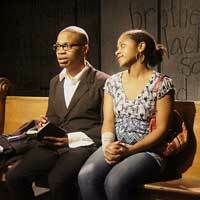 Renee Lockett's Bernadette is crotchety but a rock for her friends. It's nothing short of heartbreaking to watch her setting her alarm earlier and earlier as she struggles against the ravages of MS. Session and Williams as Tino and Deja are an adorable couple. Their banter is amusing and they inspire each other to be braver and more focused and personable as they mature. RiChard also exceeds in a difficult role. Alneesa is a detestable, bitter person, though Tino becomes uncomfortably aware that, to people who don't know Bernadette, the short-tempered lunch lady comes across that way, too. The first half of Surely Goodness and Mercy has a slower pace than the second, and that's so it can take its time establishing these characters. But once that's done, we're well-invested and can join them on their journey."